In life, the journey is just as important as the destination. So it has been with the journey of Linder Tire that began nearly 85 years ago when Henry Linder (1909-1999) purchased a bankrupt tire business for $2800 in the midst of the Great Depression. The customer service, honest hard work and integrity he established as pillars of the business continue to provide a firm foundation for the third-generation family business. Linder roots run deep in the local community; Henry Linder's grandparents, Anton and Anna, settled north of Iowa City in 1845 on "Lime Kiln Farm." Anton and his eight children mined limestone for lye. Some of that lye was then used in mortar to construct early Iowa City buildings such as the St. Mary's and St. Wenceslaus Catholic Churches. Henry's father Otto, farmed north of the Iowa River in an area now called "Linder Point". In 1926, after graduating from City High, Henry began a job at Bernie Sparks Standard Tire at the age of 17. 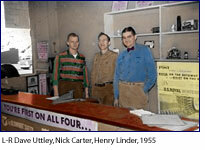 It was from these humble beginnings that Linder Tire came to be in July of 1932. Henry's purpose for the new business was to provide his customers safe travel on quality tires. Although many changes have taken place in the tire business in the eight decades since, Linder Tire remains committed to that basic standard. During the second month of operation of his new business at 21 East College Street, the Great Depression dragged on and 11 million Americans were out of work. But even in the midst of tough circumstances, a bright spot appeared; Henry Linder hired Bill Poggenpohl. Thus began a tradition of hiring that has produced long-term employees who are considered as much family as they are co-workers. Beginning in the 1930's thru the mid 1990's, Bill and his brothers, Bob and Mike, accumulated approximately 150 years of service with the business. Although some things have changed over the years, this fact has not: current employees bring well over 300 years of experience with them to work each day.